Three major parties are trying to convince the electorate that they can handle a difficult era of enormous change. Pakistan’s general election is set for July 25, and the battle lines are clear. Three parties are contending the national leadership – the Pakistan Muslim League-Nawaz, the Pakistan’s People’s Party, and the Pakistan Tehreek-e-Insaf – and all three have big issues to confront: the problem of deep ethnic divisions, the implications of Chinese-backed economic growth, and the influence of the military. It’s still unclear who exactly is meant to benefit from Pakistan’s rapidly growing economy. The incumbent Pakistan Muslim League-Nawaz government has grown the economy at almost 5% per year over the last five years – and did so by improving the electricity supply to major industry, offering massive tax cuts to large companies, curbing terrorism, and attracting Chinese investment. The resulting growth promises significant improvements in the standard of living for millions of Pakistanis, but it also comes with risks. High spending has created an enormous fiscal deficit and foreign debt burden. If left unchecked, it could force the government to accept a potentially disastrous IMF bailout with strings attached. An influx of Chinese money promises to help refill the state coffers, but many Pakistanis are also worried about the looming prospect of Chinese neo-colonialism, particularly the Chinese-Pakistan Economic Corridor, a plan that could see Chinese enterprises infiltrate all areas of Pakistan’s economy. An extensive Chinese-run security monitoring and surveillance system in cities from Peshawar to Karachi has further heightened concerns of unchecked Chinese influence. For their part, the two main opposition parties are committed to achieving a “strong economy”, but their plans are threadbare. Unlike either of its rivals, the Pakistan’s People’s Party’s manifesto focuses on redistributing the fruits of improved growth and promises to promote trade within the region. But its economic policy to support manufacturing, the cornerstone of national growth, remains vague. 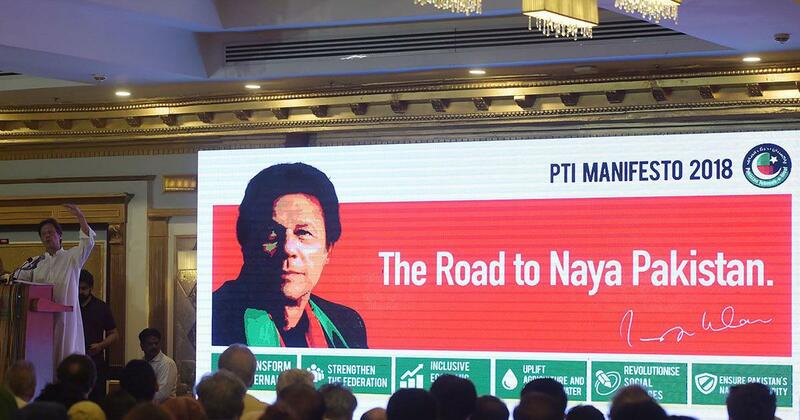 The Pakistan Tehreek-e-Insaf has also said it will pursue prosperity and reduce poverty, but less than one month away from the election it has failed to define how this will be achieved. Without some more clarity from the opposition, voters may prefer to stick with a party that’s been tried and tested. The Pakistan Muslim League-Nawaz’s supporters praise it for its major infrastructure projects, such as a major bus and metro transit system. But in reality the Pakistan Muslim League-Nawaz has concentrated development in Punjab province to cater to its support base there. This continues a long pattern of uneven national development that has entrenched Punjab’s advantages over Khyber Paktunkhwa, Sindh, and Balochistan provinces, in turn fuelling the nation’s ethnic tensions. Both opposition parties have strong support in their home province: the Pakistan’s People’s Party runs the provincial government in Sindh, and the Pakistan Tehreek-e-Insaf governs Khyber Paktunkhwa. Both are now also campaigning hard in Punjab to secure the minimum 10m votes required to upset the incumbents there. The Pakistan Muslim League-Nawaz has an ethnic stronghold and history of support in Punjab. But with the opposition campaigning hard to lure Punjabi voters, the Pakistan Muslim League-Nawaz is reaching outside Punjab, promising to deliver the major transport infrastructure they brought to Punjab. Since the Pakistan Muslim League-Nawaz doesn’t have a track record of bringing development in their provinces, voters in Khyber Paktunkhwa and Sindh will have to hope they mean what they say, or stick with their own provincial parties. While this is on the face of it a civilian election, Pakistan’s de facto ruling power is the military. It is widely popular in large parts of the country, and has enormous influence over the civilian government and civil society. In the past year alone, a number of journalists critical of the military have received threats to their personal security, including several abduction attempts. It also controls much of the media. Military representatives blocked the distribution of Dawn, the nation’s largest English language newspaper, in large portions of south Pakistan after it published an interview with the former prime minister and PML-N leader Nawaz Sharif, in which he criticised the military and accused it of acting as a “parallel government”. Tensions between Sharif and the military escalated in October 2016 after Sharif asserted himself on foreign policy and national security, traditionally the domain of the military. He went so far as to warn the military of Pakistan’s growing international isolation because of its continued support of militant groups. The military responded by demanding that both the journalist and newspaper responsible for the leak be charged with treason under the Official Secrets Act. The military and Sharif clashed again in 2017 when the Supreme Court investigated Sharif on corruption charges. The investigative team included members of the Inter Services Intelligence agency and Military Intelligence, Pakistan’s spy agencies. The Supreme Court – which some accused of working hand-in-glove with the military – disqualified Shariffrom serving as head of a political party, citing a constitutional article obliging lawmakers to be “truthful” and “honest”. On Friday July 6, the nation’s accountability court awarded Sharif ten years’ jail time and an £8m fine for owning assets beyond his known income. Despite the verdict, Sharif remains a powerful figure in the Pakistan Tehreek-e-Insaf and is still highly popular among its supporters. The military’s favourite contender is the Pakistan Tehreek-e-Insaf’s Imran Khan. 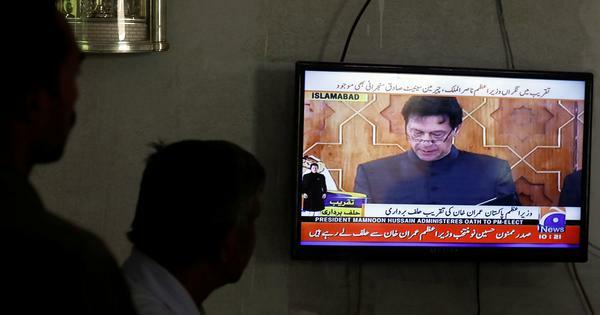 The Pakistan Tehreek-e-Insaf has gained a strong supporter base off the back of its anti-corruption campaigning and Khan’s penchant for whipping up populist sentiment through pop concert-like mass demonstrations (dharna). Unfortunately, Khan’s theatrics and personal dramas have overshadowed the achievements of the Pakistan Tehreek-e-Insaf-led regional government in Khyber Paktunkhwa, where the party has made great strides in healthcare and education. The incumbent government has made huge investments in infrastructure that have spurred growth but run up debts that risk an economic slowdown and overdependence on China. But the challengers have yet to prove themselves on the national stage, and are yet to reveal a clear strategy for improving the living standards of ordinary Pakistanis. So will voters play it safe and vote for the Pakistan Muslim League-Nawaz, which offers them lopsided but rapid development? Or will they roll the dice on either the Pakistan’s People’s Party or the Pakistan Tehreek-e-Insaf’s utopian visions of a prosperous and poverty free Pakistan? Either way, July 25 is approaching fast – and it could be a momentous day indeed. Rosita Armytage, Fellow, Department of Anthropology, Durham University. This article frst appeared on The Conversation.